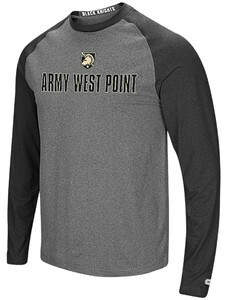 Keep comfortable in whatever you do when you wear this Mens Army Black Knights Social Skills Raglan Synthetic Long Sleeve T Shirt from Colosseum which comes with a Heather Grey body and team color contrasting sleeves. This Collegiate Shirt is constructed from 5.29 oz 92/8 Brushed Polyester/Rayon material which helps wick moisture from your body for cooling. This NCAA Standard-Fit College Tee Shirt features a front Team Rubberized Print to show which team your cheer for all year long.